As someone who loved Jasmine, the Thai and Vegetarian (along with good Chinese) restaurant in Midtown's Cooper-Young neighborhood, I was saddened when it went out of business. From the time I moved back to Memphis twenty-two years ago, Jasmine was one of my favorite go-to places for a nice dinner in an intimate, homey setting. I loved being served by Cindy (I believe that was her name), who always greeted me with a cheerful smile and gracious demeanor. She would recommend a great entrée that I enjoyed immensely, consequently making my dining experiences memorable. Despite the wonderful times I had there, Jasmine did not endure the rough economic times of the past several years. Now what I'm about to say next is only a theory, something that's based solely on my observations. After the Great Recession of 2008 where millions of people (including me) lost jobs, homes and other worldly possessions, I noticed changes at my favorite Vegetarian restaurant. First, there weren't as many diners there as there were in the past. Consequently, the restaurant had to let go of its servers, leaving only the old lady (probably the owner; I wish I knew her name) as the only person serving customers. With so few customers, it was only a matter of time before the restaurant went out of business. I'm not sure if this happened because of the recession or not, but it was nonetheless sad to see the restaurant go away. For awhile, I would mentally reminisce whenever I drove by the former restaurant, longing for a day when it would reopen. In the meantime, I became acquainted with another charming little restaurant: Elwood's Shack. For those who don't already know, the "Shack" serves some of the best barbecue in Memphis. Known for its brisket that is great by itself, on a burger and in a taco. Speaking of tacos, one of best non-barbecue meals you can get at the "Shack" is the Steel Trout Taco, a behemoth that's loaded with trout, creamy horseradish, Pico de Gallo and other veggies that make it great. So if you're a fan of the "Trout" and other piscine things that Elwood's serves, you might think "what if Elwood's opened a nice, quaint seafood restaurant?" Well, you end up with Elwood's Shells in a place where Jasmine used to be. Like its Asian predecessor, Elwood's Shells is small with only a few tables so seating might be a bit of wait if one were to arrive during peak dining hours. Unlike both Jasmine and the "Shack," the "Shells" has a bar for those waiting for a table although it isn't serving alcohol yet (from I noticed, you can go B.Y.O.B. if you're yearning for that glass of Yellow Tail Chardonnay wine that was my favorite at Jasmine). The overall decor of the "Shells" is more colorful than Jasmine, with the walls painted sky blue and its very colorful tables. From an intimacy perspective, Elwood's Shells doesn't quite have the homey charm that Jasmine had, although that might be a bit premature given the place was full of diners during my visit (the first week of its opening). That said, I don't know if this will be my new favorite restaurant to chill on a Saturday night or an upscale version of the Soul Fish Cafe. Regardless, I'm a fan of the "Elwood's" brand who was really anxious to dive into the menu. 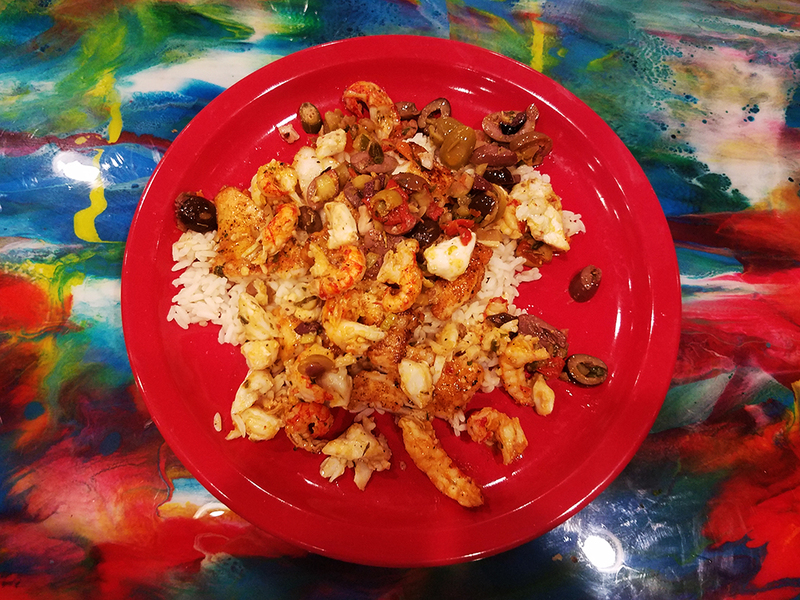 For the main entrée, I had the Croaker and Olives, which is a mix of black and green olives, crawfish tails, crab and croaker on top of white rice. For those of you who are unfamiliar with the croaker, it is a saltwater fish that lives in the Atlantic Ocean, spanning from Massachusetts to Texas (I was never aware of it during my six years on the Florida Gulf Coast). In terms of texture and taste, it is comparable to catfish even though that is a freshwater fish. As for the Croaker and Olives, it was great. The croaker, maybe having a slight touch of garlic, was very tasty, and when mixed with the buttery rice and the flavorful olives and the other seafood made for an outstanding meal. Although I consciously wasn't aware of it at the time, the fish and rice dinner was a bit of déjà vu as it relates to the many meals I had at Jasmine. Just like the Hunan fish I had many years ago, the Croaker and Olives is an entrée that will be memorable for a long time. Leading up to this wonderful meal, I had a couple of appetizers that are very noteworthy. 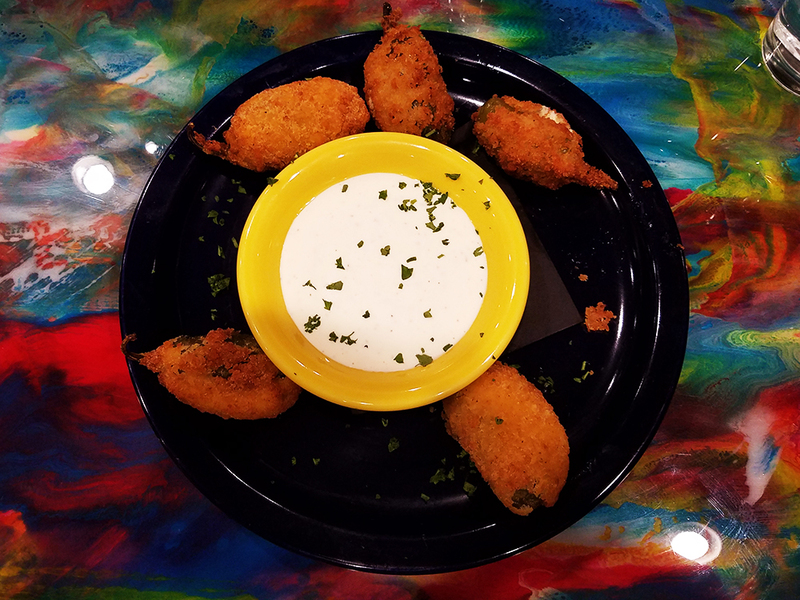 The first was the Gator Eggs, which are jalapeño poppers stuffed with cream cheese, shrimp and crab and served with ranch dressing. While it was spicy and flavorful, it lacked one key ingredient: gator. As a former Floridian, I can attest that alligator meat is pretty good, especially when cooked in spicy seasonings. The taste is similar to frog legs in that the texture is comparable to chicken even though the taste is more like seafood. I hope that in the future, Elwood's can incorporate gator meat in either the "Eggs" appetizer or some other menu item. 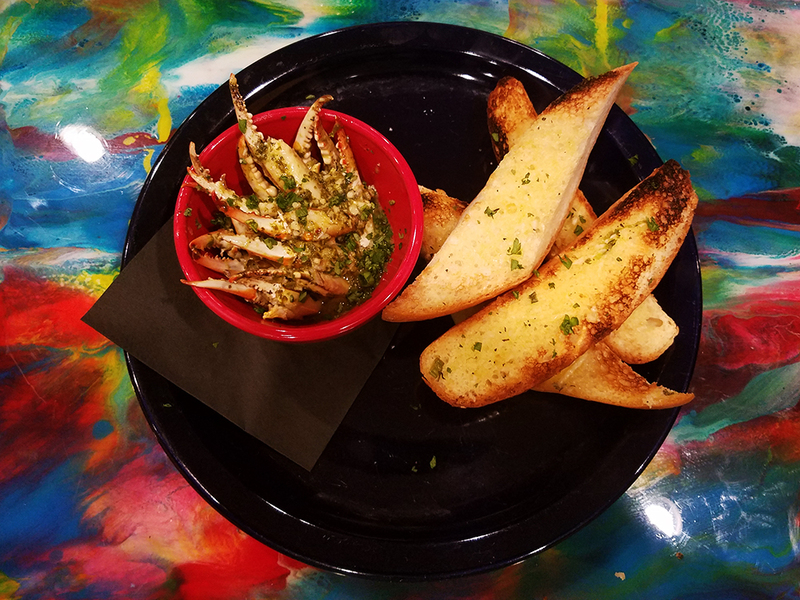 The other appetizer that I had was the Citrus Crab Fingers, which were crab claws served with citrus butter and homemade garlic bread. Eating this was an interesting experience, for the "fingers" didn't have a lot of meat that you can sink your teeth into, but the orange-tasting crab claws were succulent and delightful. Also worth noting is that the garlic bread was fresh and very tasty when dipped in the citrus butter. I want to note this appetizer was complimentary due to my waiting for the main course (personally, it wasn't that long but I appreciate it anyway). Overall, my first experience at Elwood's Shells was great. I'm anxious to go there again for the po' boy sandwiches that I'm confident will be very good. I might wait until the fanfare surrounding the restaurant's debut dies down, although that might be awhile if its popularity is as strong as Elwood's Shack. Then again, I frequently go the "Shack" despite getting only a thirty minute lunch break so I probably won't be deterred by crowds at the "Shells." So although it might never be "Jasmine," it could be my new home away from home. Speaking of new businesses, I am embarking on an endeavor of my own. I decided to pursue projects as a freelance graphics specialist, emphasizing on graphic design and areas that involve prepress production. "Prepress," for those unfamiliar with the term, involves various techniques used to prepare a document for print. Depending on the document, it could require anything ranging from retouching and resizing photos, cleaning up low-resolution images (and converting them to scalable, high-resolution vector graphics) and color separation for plates used in non-digital printing (screen, offset lithography, etc.). When dealing with printing companies, it can be as daunting as dealing with an auto mechanic, especially if you're trying to get quality printing. In my experience, most printers will either take your project as is and print it with no regard to quality, or will charge exorbitant fees to make your project print ready. By contrast, my rates are very reasonable and I know what to ask and expect from printing companies regardless of the medium it uses to print. I can be your guide to help you meet your printing goals.